Never was the spirit of MOTORHEAD more alive than when they were on tour, shake, rattle and rolling audiences to within an inch of their lives thanks to that indomitable cocktail of power, purpose and head-crunching volume. In fact, after four decades of bone-pulverizing duty, Motörhead were still enjoying sold-out gigs worldwide. 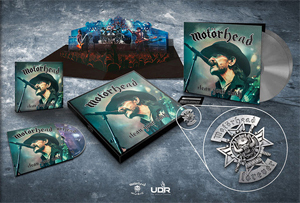 On November 20th and 21st 2015, at the Zenith in Munich, Germany, UDR Records made the decision to record - what happened to be the very last live shows ever recorded - and MOTORHEAD proceeded to deliver two storming sold out shows. Where there had once been almost too-fast breakneck pace, there was measured yet still thunderous rock’n’roll served up only as they could, Phil Campbell playing better and better, and Mikkey Dee elevating the art of drumming to the superlative heights which made him one of metal’s most coveted skinsmen. Check out the “Bomber” video from the upcoming release on KNAC.COM right HERE.